In 1843 as the industrial revolution gathered pace and Sheffield was on the verge of becoming the steel, tool and cutlery making capital of the world, the Sheffield School of Design was founded following lobbying by artist Benjamin Haydon. The day-to-day running was controlled by the local council, whilst the Board of Trade in London appointed the head. Tuition began in a 60x40ft rented room off Glossop Road. 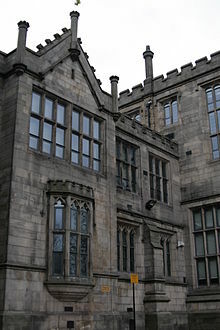 In 1850 the School of Design was renamed Sheffield School of Art. In 1905 the City of Sheffield Training College (later renamed Sheffield City College of Education) on Collegiate Crescent admitted its first 90 students. In 1967 the Owen Building was constructed. Built in a functional 1960s design, it has since been modernised and comprehensively renovated with an atrium linking it to four adjacent buildings. 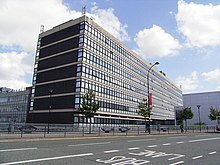 In 1969 the Sheffield School of Design merged with the city's College of Technology to form Sheffield Polytechnic. 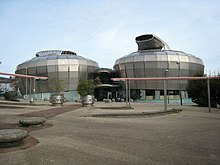 In 1976 Sheffield Polytechnic merged with the city's two teacher training colleges (Sheffield City College and Totley Hall College) and was renamed Sheffield City Polytechnic. 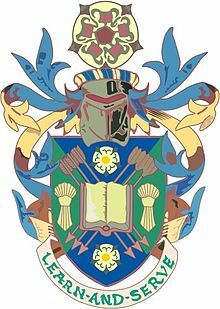 In 1987 Sheffield City Polytechnic became a founding member of the Northern Consortium. 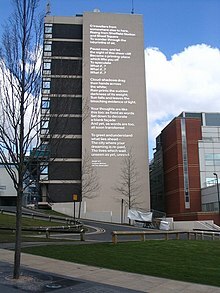 In 1992 Sheffield City Polytechnic became Sheffield Hallam University (SHU), with the right to award its own degrees. In 2005 SHU was reorganised into four faculties. The new Faculty of Development and Society, with an emphasis on 'people, places and spaces', brought together education, geography, humanities, law, and social sciences. At the same time, with the intention of further developing research and teaching in the new Faculty of Health and Wellbeing, a new Clinical Academic Group was launched. The building that had been designed and constructed to house the National Centre for Popular Music became the university's students' union building (the HUBS). The Nelson Mandela Building, the former students' union building, was sold and has since been demolished. In 2007 SHU took over the teaching of nursing and midwifery from the University of Sheffield. These activities are now based at the Collegiate Crescent Campus. 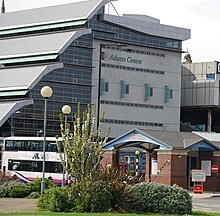 The following year the Psalter Lane campus (formerly the Sheffield College of Art) was closed, and the activities transferred to the City Campus. The £26 million energy-efficient Furnival Building opened in September (renamed Cantor Building in 2011 in recognition of a major donor to the university). The building, which includes teaching spaces and an art gallery has been described as "the impressive new entry point to the campus". Art & Design; Business Systems & IT; Communication & Media; Computers & Computing; Engineering & Technology; Mathematics & Statistics; and Multimedia & the Internet. Architecture; Built Environment; Education; English; Geography & Environmental Science; Humanities; Law & Community Justice; Planning; Social Sciences; and Performing Arts. Biosciences; Diagnostic Radiography; Nursing & Midwifery; Occupational Therapy; Operating Department Practitioners; Paramedic Studies; Physiotherapy; Radiotherapy & Oncology; Social Work; and Sport. Business & Management; Facilities Management; Finance, Accounting & Business Systems; Food & Nutrition; Language & Culture; and Tourism, Hospitality & Events Management. British barrister, broadcaster, and life peer of the House of Lords Helena Kennedy was installed as Chancellor in a ceremony at Cutlers' Hall on Thursday 26 July 2018. SHU is the lead partner for Higher Futures, the Lifelong Learning Network (LLN) for South Yorkshire, North Derbyshire and North Nottinghamshire. In the National Student Survey, several subject areas at SHU have performed very well in terms of overall student satisfaction with their courses: for example, architecture and geography have both been placed first, and planning has been placed second. In the 2013/14 university league tables, Sheffield Hallam University was placed 73rd out of 116 UK universities by The Guardian University Guide; 62nd out of 123 by The Times & Sunday Times Good University Guide; and 66th out of 124 by the Complete University Guide. SHU received a First Class award and was ranked 15th out of 151 universities in the People & Planet University League 2015 which assesses universities on their environmental credentials. Nazir Ahmed, Baron Ahmed, Labour Party Peer. Peter Booth Australian modern bleak landscape painter. Graham Gristwood and Emily Benham, World Champions in Orienteering. Andrea Hirata, Indonesian Writer of "The Rainbow Troops"
Andy Whitfield, actor best known for his role in TV drama Spartacus. James Whitworth, (English 1992–95) national cartoonist & writer: Private Eye, Prospect, Sheffield Star & Sheffield Telegraph. Author of DCI Miller crime novels. Alison Adam, professor of science, technology and society. Geoff Cartwright, senior lecturer in Environmental Conservation 1995–2012: joint winner of the 2011 Individual award in the Environment Awards of the Sheffield Telegraph for his work on the development of a nature reserve at Blackburn Meadows on the site of the former Tinsley sewage farm. Dave Wickett (1947–2012), lecturer in Economics, served on the industry and economics committee of the Campaign for Real Ale; in 1981 he established the Fat Cat (a real ale pub on Kelham Island) and in 1990 he launched Kelham Island Brewery; in 2004 his golden ale, Pale Rider, won Camra's Champion Beer of Britain award; in 2010 he set up a post-graduate course in brewing at Sheffield University, and in 2011 he was given a lifetime achievement award by the House of Commons all-party parliamentary beer group. ^ "Key Facts". Sheffield Hallam University. Retrieved 30 October 2011. ^ "Sheffield Crescenters Association annual reunion". shu.ac.uk. 1 October 2011. ^ "The Owen Building". skyscrapernews.com. ^ "Owen Building Refurbishment". baggaley.co.uk. ^ "University gets keys to Furnival Building". Sheffield Telegraph. ^ "Human rights champion installed as Chancellor". www.shu.ac.uk. Retrieved 10 January 2018. ^ "The University's first chancellor)". shu.ac.uk. Retrieved 13 November 2018. ^ "Sheffield Telegraph Environment Awards sponsored by Amey: Meet our winners - VIDEO" – via www.sheffieldtelegraph.co.uk. ^ Protz, Roger (23 May 2012). "Dave Wickett obituary". The Guardian. London. ^ "Mike Wild about nature". 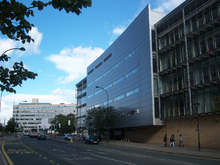 Wikimedia Commons has media related to Sheffield Hallam University.